Hiele’s music surfaces in the form of hard to pinpoint electronica, built on a longtime obsession for synthetic sound creation and jazz studies. On stage, Hiele plays with expectation, going past what is considered conventional, blending improvisational and classical elements into a no-nonsense personal idiom. Hiele has released his music on the Antwerp based label Ekster (Ritmische Bezinning 2016, Essential Oils 2014, Hiele 2013,). In 2016, YYAA Recordings released Hiele’s performance in the Schinkel Pavilion, Berlin 2014. In November 2016, Hiele released his first OST to the documentary Saints via Ekster. His latest record, a collaboration with Lieven Martens is out on Ultra Eczema. 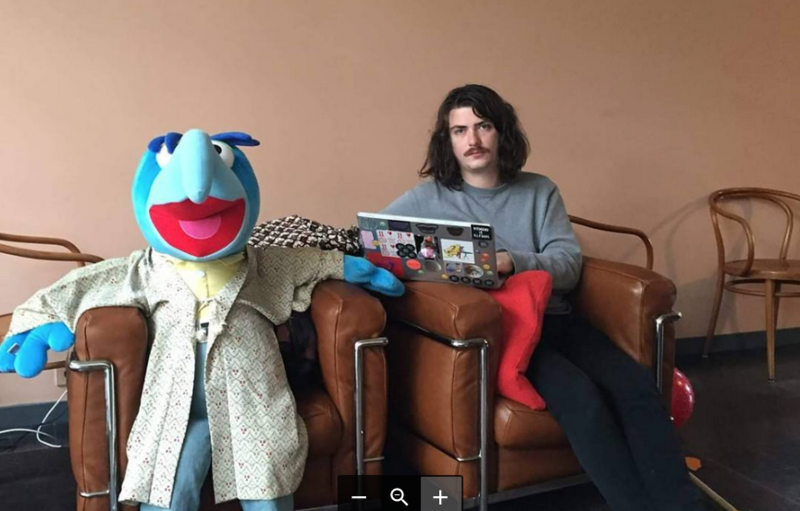 You are based in Antwerp, which has quite a lively experimental music scene. Are you actively involved in it? Everybody knows each other. It takes five minutes and you’ll bump into somebody you know. It’s so tiny here. There used to be a great place called Scheld’Apen, a venue outside of the city. Dennis Tyfus, who runs the Ultra Eczema, label organized so many nights there. It used to be a squat and later got recognised as a cultural space by the city. This is where we all got to know each other. Later on Dennis used to have a space called Stadslimiet, and after five years he got a bit tired of booking and hosting people. I took over as of January. You are doing the booking? I’m doing the booking, manning the bar, scrubbing the place. I do it with my longtime friend Milan Warmoeskerken who performs as Milan W, and Allon Kaye the label boss of Entr’acte. Allon is in his forties, while Milan is my age. We’re three different guys here, and it works very well together. Our booking is also related to what we do with our labels – Allon with Entr’acte me with Ekster and Milan’s girlfriend with her label JJ Funhouse. Can you talk about Ekster? It’s a label I run with Victor Robyn. Victor does all the graphic work and my job is mainly to curate new music and host events with him. You also released the EXO compilations that feature a variety of experimental projects such as Polysick, Bear Bones Lay Low, etc. It’s a nice combination of people who are not only from Antwerp. We don’t do 12 inches, because we don’t want to go for quantity. We’ve released fourteen releases over four years and the EXO compilations enable us to include more artists. Can you talk about the vision of the label? It’s diverse. We did ssaliva, we also released Elko B. which has elements of music for children. It reflects our personal selection of music. TCF’s record was after a long friendship between Victor and Lars. Everything makes sense. It happens naturally. In terms of your own music, were you classically educated? I started off by playing violin at around the age of four or five. At the age of six I went to an after-school music training for classical violin. Then later, when I was about 13, I started to notice that my fingers were more made for standup bass. I picked it up and started studying it in high school. I had music classes every day and from there I went to conservatory to continue with double bass. In the meantime, I also started to collect synthesizers and make tunes with them. Eventually I didn’t become a soloist standard bass player, but just another electronic musician. Are you happy with that choice? Very happy. That’s what I wanted to be. I’ve always listened to electronic music. Maybe also because my parents listened to Kraftwerk, Suicide, Throbbing Gristle, etc. This helped me to love any type of music. If there’s a good amount of labour invested in making music, it makes it interesting. That started off with doing a soundtrack for a documentary about St Helena, which I released afterwards on Ekster. Then I also did a short video with kids dancing in the streets in the wake of the terror attack in Brussels. They danced and talked about what had happened, and I made the soundtrack for it. Last week I finished a soundtrack for a ten-metre hologram that will be shown in Stedelijk Museum Breda, made by Antwerp artist Frederik Heyman. It’s quite a sacral piece. I’m happy about this soundtrack work because it’s actually what I really want to do. It’s nice to be able to work with another medium and provide the music for it. I always have synths and then I do the foley work at home with microphones. The mikes are actually made by someone from SHAPE platform – Jonáš Gruska. I love them. That’s actually all I use. Can you talk about your upcoming Ultra Eczema record? It’s a duo with Lieven Martens Moana aka Dolphins Into the Future. I approached him last year to do a residency together. We went to WORM in Rotterdam and the first thing we heard was that we were lucky because they were going to move the synths. We connected and made this record. Lieven has a very large field recording archive. The way he approaches music is really free. The concept of this album is about a young man sitting at a window of his castle looking over to the dark forest. It’s definitely the weirdest thing I’ve made so far. Last week we played a gig in a church. Lieven was 30 metres away from me playing a church organ. I was singing fisherman’s songs in Italian.